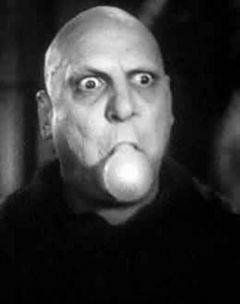 With my SIDAC driver and a light bulb, I thought I'd try my hand at doing an Uncle Fester impression. Remember him from the Addams Family? I'm putting about 40kV out of the ignition coil, enough to spark around the globe. What might not be so obvious is the little ground wire hanging off the globe's base. I'm not actually conducting the electricity myself! Needless to say, this was done with a full understanding of the dangers of HV and the particulars of this setup.